Over the course of my not crazy long life, I’ve heard phrases and expressions come and go. One of the more recent (and a growing irritant for me) is the term “conversational snow.” It refers to snow that falls but doesn’t stick anywhere. It’s what I would call “pointless snow,” or if I’m in a better mood, “pretty snow.” After all, it’s a lot more fun to drive home in a light snowfall that isn’t accumulating than in a driving rain. Another expression that continues to gain momentum? “It is what it is.” I know several people who can’t stand this particular turn of phrase, but it doesn’t bother me that much. After all, how else would you describe something that just cannot be changed? But I’ll tell you what I can’t stand: “I don’t know what to tell you.” What does that even mean? You say that to someone when they have a problem and there’s no solution, but not much is more frustrating to hear. It’s like an admission of failure. And finally, nobody likes it when someone says, “That’s the way the cookie crumbles.” Not only is it a stupid expression, but everyone knows that good cookies do not crumble. That’s just a bad cookie. What is magical is the perfect cookie cake. 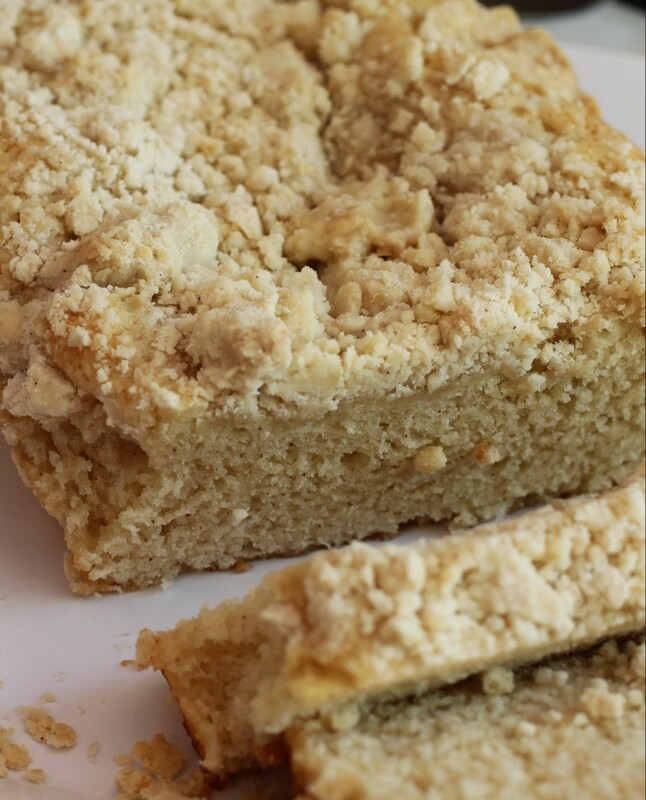 They sure as heck don’t crumble, and they’re fantastic. On the spectrum of sweets to give your sweetie, this one ranks high. It’s a peanut butter cookie, of course. But even better, it’s filled with delightful peanut butter M & Ms and piped with hot pink frosting. Let the good times roll, everyone! The only expression I want to hear this weekend is “I love you.” Over and over. Other than that, all the cliched phrases and conversational snow can just go away. Give me a snowstorm and a cookie cake and we’re in good territory! Preheat the oven to 350. Line a heart-shaped pan with parchment paper cut to fit the bottom and coat with cooking spray. Set aside. Add the dry ingredients and mix until just combined. Mix in most of the M & Ms, reserving a few for the top. Press the cookie dough into the prepared pan and place a few extra M & Ms on top for aesthetics if desired. Bake the cookie cake for 25-30 minutes until set. Cool. When the cookie cake is completely cool, carefully remove it from the pan and place on a plate or tray. In a medium bowl, mix the food coloring into frosting until the desired shade of pink comes out. Using a star tip, pipe a border around the cookie cake and cover with sugar sprinkles. Slice into wedges and serve. Store in an airtight container. I laughed when I read about “the way the cookie crumbles” part, and I have to agree, a crumbling cookie is a bad cookie! 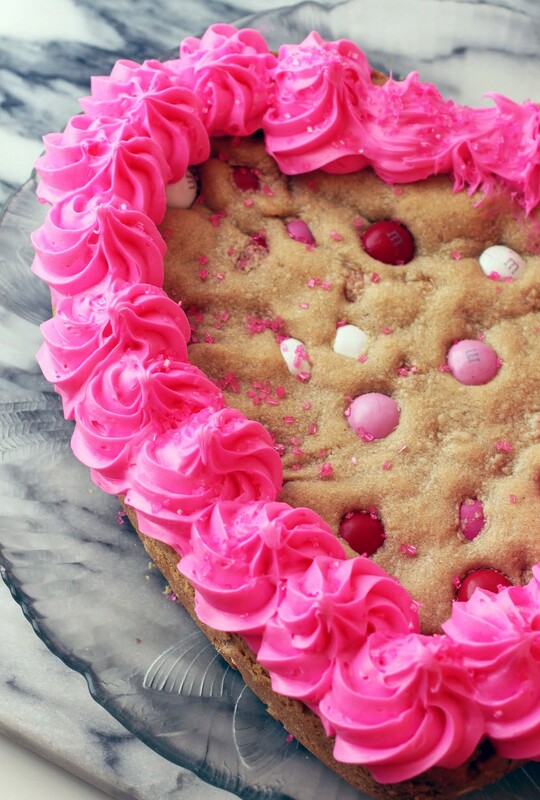 These heart cookie cake is such a sweet way to a loved one’s tummy! A cookie cake is definitely the best kind of cake! My husband always “It is what it is’…it doesn’t bother me but it is a strange phrase! 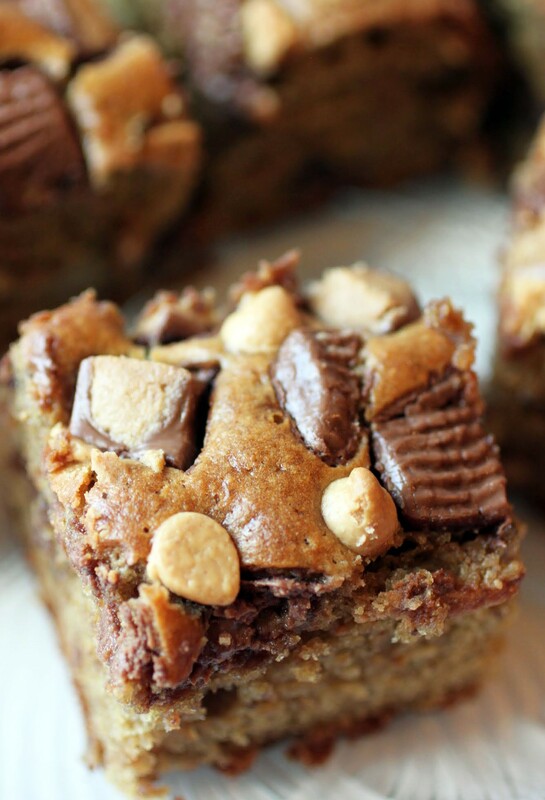 Love the pretty frosting on top and all of the peanut butter! Sounds perfect for any time of year! A lot of people are saying it more and more, Gayle! Hahhaah! I should hope they’d only use the expression if the situation were as bad as a cookie crumbling…Bad Cookie! I love how your posts always leave us with something to think about! I had a great aunt who always used the phrase ‘It is what it is’…always! And it certainly caught our attention! Like this heart shaped cookie – so pretty and delish! Just what we’d hope for on Valentine’s! Wow, if your great aunt used that phrase, it’s been around a lot longer than I’ve been aware of it! Haha, that’s the trouble with blogging, isn’t it. We have to make and post everything in advance for events like V-Day and Christmas and by the time it gets there, we don’t want to cook anything related to it. I have never had a cookie cake before, but that is something that needs to change. Definitely needs to change. Cookie cakes are the best! This is just about the happiest little heart cake I have ever seen! Thanks, Jessie! Heart cakes make me happy! Cookie cakes are the best- this one is so festive and YES YES YES to peanut butter- obsessed! Me too. Nothing is better than PB! haha I know right, only food bloggers can get this! We have already done so much baking! 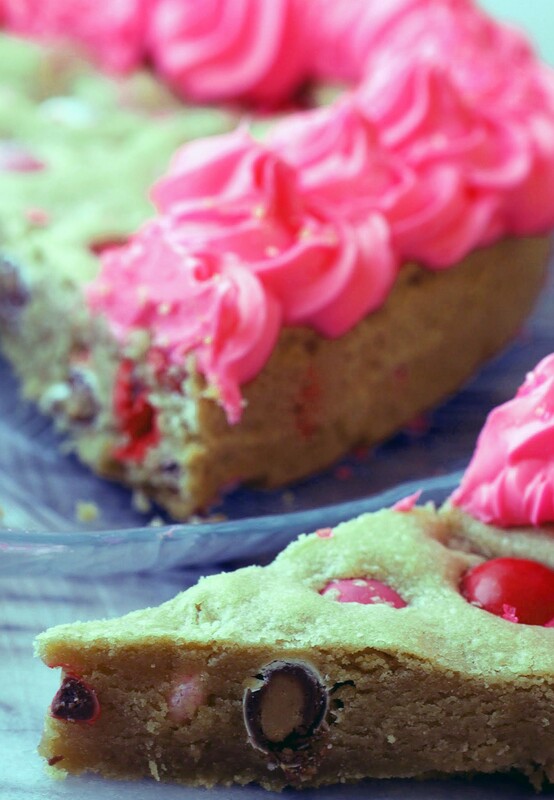 Love this cookie cake and the pretty pink frosting! Have a great weekend and lovely Valentine’s Day Mir! I’m totally working on St. Patrick’s and Girl Scouts now! 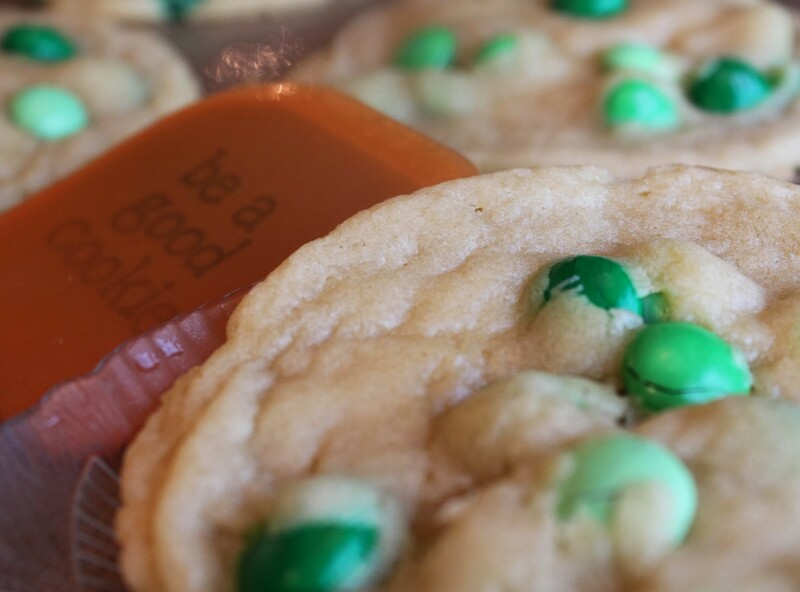 Yes, by Valentine’s Day I’ll be baking for St. Patricks and Easter! No more pink for me, lol. LOVE THIS idea! I love how we think two months ahead of all the holidays! Pointless snow. Amen. Peanut butter. A-freakin-men. Cookies cakes are the bomb! Happy V-day Mir! I think we’re getting more pointless snow. Argggg! Love you too, Kate. Have the best heart day! You too, Alice. “I love you” is the best expression ever! It’s not an expression, but I’m getting sick of people saying the phrase “I know, right?” I swear I hear that about twenty times a day. And sometimes, no, I really don’t know. This cookie looks like a big happy smile. And that pink piping looks absolutely perfect! How sweet. 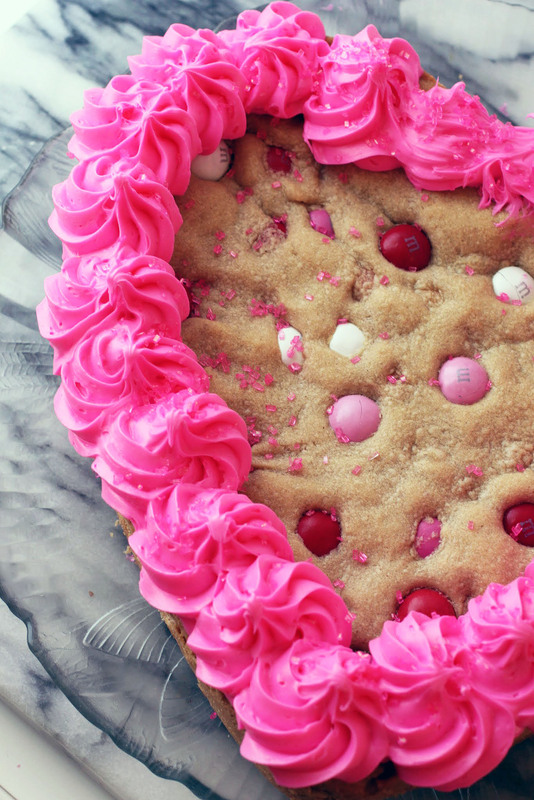 First of all, this cookie cake is SO pretty! LOVE the pink. And peanut butter is one of my faves. Oh my gosh, by the time Valentine’s Day came around this past weekend, I didn’t want to look at another heart! Thanks, Michele. I never get tired of hearts! Yes!! I’ve always wanted to make a cookie cake like The Great American Cookie. Love the fun pink swirl frosting too. 🙂 Wish I had a heart pan, but a circle still works! Circle pans work great, too!